Week after week and month after month, there’s one meal that readers ask me about more than any other: breakfast. This is probably due to the lack of breakfast visibility on CR: I tend to be more interested in my lunch and dinner creations than my morning ones, and so I post far more of those recipes than any other. Of course, that doesn’t mean I don’t love my morning meals: I do! I simply don’t tend to invest them with much innovation. Oats and oat bran (cooked) are a staple for me, especially in cool months. Smoothies (which I frequently like to blog about) are another morning standard. I love smashed avocado or raw nut butter on sprouted grain toast, and I love baked yams with coconut butter. Sliced bananas with almond milk and ground flax seed are another summertime favorite, as is chia seed pudding. And on days where I’ve got a very early lunch planned, I’ll sometimes drink fresh juice all morning (note, however, that this is atypical, and if I do juice till lunchtime I’ll very consciously add a lot of heft to my later meals). You can find a summary of some of my breakfast favorites here. And there’s nourishing breakfast I love, which I’ve yet to blog about: buckwheaties and almond milk. One cup of cooked buckwheat provides four grains of insoluble fiber, which means it’s an excellent food for aiding in elimination! I usually eat buckwheat cooked, but it’s also one of my very favorite grains to sprout (see my wheatberry sprouting post for some how-to info). And lately, I’m loving raw, dehydrated buckwheat — which I and many fellow raw foods lovers call “buckwheaties” — as a breakfast cereal. Cold breakfast cereals fall into the category of “dishes Gena didn’t like cooked, but loves raw.” These include soups (I really didn’t become a soup lover until I started playing with raw soups), milk of any kind (thank you, almond milk! ), and crackers. Memories of being forced to eat cereal as a kid make me shudder, which is peculiar, since I always did (and still do) adore hot cereals. Anyway, I digress. Raw granola (like One Lucky Duck’s spectacular blend) and the buckwheaties I’m about to share, coupled with learning how to make fresh, delicious nut milks, changed cold cereal as I knew it. Now, buckwheaties are one of my favorite summer breakfasts, and I hope they’ll soon be one of yours, too! The procedure is simple. 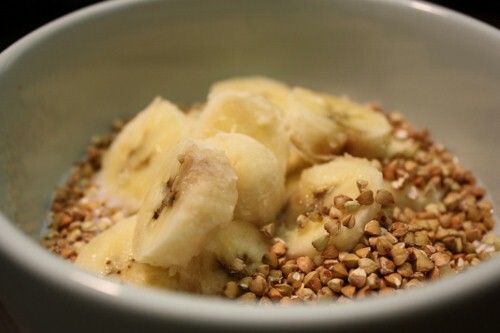 Begin with a cup of raw buckwheat groats. You should be able to find these at any grocery store, but you could also order them here. Immerse them in 3-4 cups filtered water, and let them soak overnight. In the morning, rinse off the water and replace it with fresh water. The soak water ought to have gotten slimy and thick overnight: this is 100% normal, and right. After another 8-12 hours of soak time, rinse the buckwheat again. It ought to have plumped up to nearly the size it would if you were to boil it. At this point, you could let the grain sprout. But if you want to make buckwheaties, simply lay it on Teflex-lined dehydrator sheets and dehydrate it at 115º for 6-10 hours, or until it’s really dry and crispy. If you don’t have a dehydrator, you can toast it in the oven at 300 for about 30 to 40 minutes, or until it’s crispy and totally dry. And then I like to top it off with some blueberries for color! So there you are. A raw breakfast that’s appropriate for summer temperatures, but provides the satisfaction and staying power that smoothies sometimes lack. Soon, I’ll show you more uses for buckwheat; it really is a wonderfully versatile grain! Yuuum! Also baked sweet potato with coconut butter sounds delicious. Have to try that this weekend! 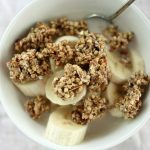 I love cold cereal, and lately I’ve been more and more intrigued by the idea of making my own. Thanks for sharing your recipe! I’ve also heard quinoa works well. 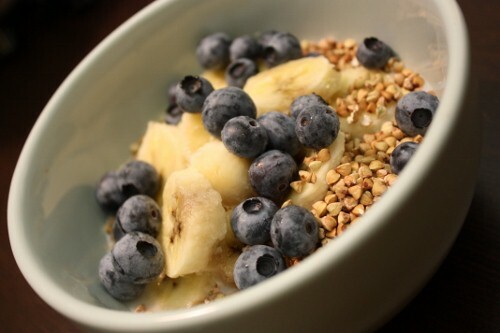 Blueberries make the best cold cereal topping! Thanks for this! i am now working out of the home and I am always on the search for great raw breakfast ideas! I really love buckwheat…I usually buy it at Whole Foods and cook it up like Cream of Wheat but I have never tried it raw. Thanks for the great breakfast idea…those are always a challenge for me! Thanks for letting people know that buckwheat slime is normal. Many who are gluten-free baked with BW; because of the natural slime, it does not require any additional gum! I love buckwheat! There is a raw restaurant near my apartment that sells buckwheat granola (dehydrated) and there are different flavours. They are all so delicious. I really wish I could make something like it myself, since they are so expensive, but I don’t have a dehydrator! I’m hoping to get one soon…for now, I will try following your directions to make buckwheaties in the oven and see how it compares. OMG – that is too funny – I was just thinking yesterday “I really need to figure out this whole buckwheat cereal thing made in the dehydrator” since I just got a dehydrator last week and then you post this. Awesomeness. Thank you!! Oh and PS, where do you find those nice large white bowls for your kale salad (and for your cereal today). I need to find a couple larger bowls because our bowls are just too low/small for big salads. Breakfast tends to be more of a utility meal to cram before work for me and usually a smoothie. Not a great way to view it and hardly a noteworthy meal, but handy to consume while getting ready. Love buckwheat, both sprouted and cooked : ) I have always liked the taste!! i just became aware of how great buckwheat is and really wanted to incorporate the raw grain into my breakfast so I made breakfast buckwheat bars. No dehydrator here, but I’m willing to try the oven version! I may even try it with millet. Thanks for the recipe, my dear. “I’ve yet to meet a whole grain I didn’t like. ” – a million nods from me. When I soaked these for my first time in my dorm room, I was amazed at the nastily sticky soak-water I had to drain off. I like them straight out of the bowl I soaked them in, too! As ever. Just as I start toying with raw breakfast preparations beyond smoothies, which don’t fill me up enough, Gena to the rescue! Sarah, how long does it take them to dry in the sun? I’d like to try this too. This looks great Gena! Do you ever eat overnight soaked oats cold? Would this count as raw? If you use old fashioned oats (ie, unless you use whole oat groats), these aren’t raw. I’ll have to try buckwheat raw sometime. 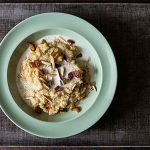 I love just adding rolled oats as muesli to my breakfasts, either with yogurt or rice milk. The crunch is just what I crave, and it’s wholesome and filling. makes me have serious dehydrator envy. great recipe and thx for point out that BuckWHEAT is still GF. Most people are confused about that, great to remind folks. Then there’s wheatberries. No wonder it gets confusing! 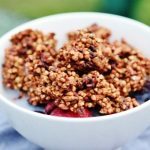 Buckwheat crunchies have been my breakfast of choice lately! I love them! Last time I experimented with adding a dash of salt, garlic powder, and oregano before dehydrating them. It turned out well, kind of a crunchy snack type of thing. Another winner, Gena! I had no idea that buckwheat was so versatile, healthy, and delicious. I’m definitely going to have to see if I can find some and give it a try – those photos have me drooling. My breakfast is usually the same old thing – green smoothie! I like it, know it’s great for me, gives me just the right amount of fuel to keep me through lunch, and it’s light first thing in the morning. I get much more excited about lunch and dinner, too. But…this post might have inspired me to break out of my rut – thank you! I’ve been loving groats lately – done as a cold oatmeal in the food processor. I’ll have to try this method too, thanks! Your reference to ground flaxseed raised a question for me. I’ve heard that flaxseed should be ground to obtain the most nutrients. Is this true? When I tried to grind them in my processor, it didn’t seem like anything happened to them. Any sage advice? Thank you for the instructions! I buy raw buckwheaties, but would love to make my own! I would love to try buckwheat cereal! It looks delicious. Thanks for posting! Thanks for another amazing post, Gena! Here’s my q… alot of raw foodies advocate not eating breakfast, and not even ‘indulging’ in a green juice until noon… what is your take on this? I am never hungry in the morning, although I do workout… Am i best to hold off until my body really wants something? In a word, no, absolutely not. “Holding off” until you’re starving for food is just another way of saying “restrict/fight hunger,” which is a point of view I find not only intolerable, but also nutritionally foolhardly. It means not necessarily getting enough nutrients over the course of a day, and also, it can slow the metabolism. There are exceptions. If you sip juice all morning long (ie, quite a bit more than 16 oz), and perhaps pair it with a smoothie, you can certainly get the caloric density you need. Also, it can be sensible to sip several juices if you know lunch is imminent (as I said, I’ll do green juices all morning if I know that I’m eating lunch at, say, 11:45 or noon, which I sometimes do for work). But if you work out in the morning, are otherwise very active, or plan to eat at a normal lunchtime (ie 1 pm), it’s probably not sufficient to simply have juice. Thanks for the great post! I was wondering about food combining- the buckwheat and almond milk. If someone is trying to follow proper food combining, what would be the best mylk option to use with buckwheat cereal? Thanks! A very rigid food combiner would need to use a grain milk, like rice or oat. For those who follow more relaxed food combining guidelines, nut milks are neutral. This looks so delicious Gena!! I had a similar breakfast to this the whole first trimester of my 3rd pregnancy. It was the only thing that would settle well with me and gave me nutrition. Youve inspired me to whip it out again! Yup! We love us some buckwheat too. I make the version from Raw Food Real World with agave in lieu of syrup and a bit less of it. We often add raw carob too. Thank you for the recipe! I just made some this morning. 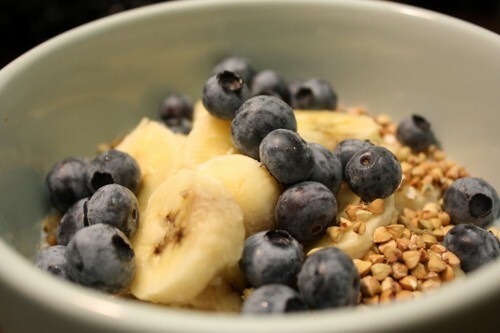 They are quite tasty with bananas and blueberries. I am a little curious though — why do we soak them and then dehydrate them? Seems like that is the same as not doing anything to them at all? Or maybe something is removed when we rinse off that slimy water? I recently discovered that I love buckwheat so I indulged in a bag of the Chocolate Crispies from One Lucky Duck. I had them with almond milk this morning and they were delicious! However, there is no nutritional information on the package so, I was wondering, what do you think is an appropriate serving size? I know buckwheat is fairly calorie dense and I don’t want to over-do it in the morning. Thanks for the recipe! I made buckwheaties in the oven this morning and love them! It worked really well. I did a few small batches and tried them at different levels of crispiness. 🙂 They’re all great! I served it with pumpkin seed milk, dates and raisin pieces. That sounds like an amazing choice of toppings! I will have to try that!! I have a question about using parchment paper. I’m anxious to try the buckwheaties but don’t have teflex sheets yet; they’re on order. Does parchment paper make an acceptable subustitute when dehydrating buckwheat? Thank you! It does! That is what I used and they turned out perfectly!! I was introduced to your site from a Facebook friend. I love this article and some of the others that are linked to the post. Great content. Really looking forward to following and connecting. Hi, this is all very inspiring. Thanks for your posts. Can you tell me how long do the soaked and dehydrated BW groats keep well? Surely you can do a big batch and store but do you know for how long? Buckwheat is the healthiest grain ever! Thanks for sharing! I love your blog! Ever since I tried the banana sushi, I have been hooked. I tried to do this buckwheaties and after I dried them in an oven at 200 degrees for several hours they still taste very hard. Could I have done something wrong during the soaking? I let it soak for a whole day and then a whole night, changing the water and rinsing twice. Thank you! It can vary from batch to batch…just try soaking a bit longer next time! What a great article to stumble upon. Just reading this made me excited for breakfast now! Looking forward to trying some recipes from here, very well written and inspiring. Thanks! This looks really good. I’ve been wanting to start sprouting, but am not sure where to go for reliable information. I’m kind of a nerd and like to read up on new things and the internet seems to have conflicting info. What resources did you use when you got started? Also, I see that you live in DC. I do as well. What stores have you found buckwheat groats at? The ones I go to don’t seem to carry it. I’ve been following your blog for awhile now and am so grateful to have such a wonderful resource. Especially during a time when you’re doing something different that a lot of people don’t understand. Thanks! I have a question: I read in different sources that it is not good to combine food with fruits. they have a different digestion cycle. What do you think about this?? I accidentally bought kasha instead of raw buckwheat groats. If I use it in your recipe for granola, with the date paste should it work about the same in your opinion? I am assuming that both ways (toasting it yourself and buying toasted) would yield similar results. Thanks! Hi Gena! I have a lot of millet. Could I use millet for this recipe, too? 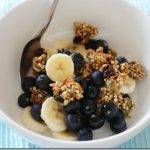 I ate buckwheat all my life, and it is one of my favorites, and never knew that it can be differently used for breakfast. Great recipe and tips for preparing. I am wondering, can I eat the buckwheat raw? does it need to be soaked twice? How long will toasted buckwheat keep? And should it be kept in fridge? I soaked it overnight, rinsed it well and toasted it in the oven for a while…I know I have more than one serving! 🙂 Love your blog!! Did you happen to post your carrot walnut cookies on your FB page??! 🙂 Thanks! If you toast the buckweaties, wouldn’t that make them not raw? Just bought the buckwheat and am excited to try these. Would you recommend soaking them in the fridge or on the counter? I’d say the counter, Amy — I always do room temperature. Hi,if I did not have a telflex sheet for the dehydrator ,could I use baking paper ? I soaked the groats as suggested but they didn’t seem to change in size. Does it matter that I put the groats in the fridge to soak? 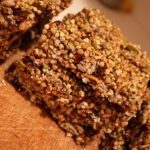 Also, do you have any suggestions for substituting the flax seed oil in your buckwheat chai energy bars? Thank you, I can’t wait to make these! For 5 months Ive been eating raw buckwheat with almond milk regularly. However, I haven’t been doing the soaking ahead of time. Is the soaking necessary? I found buckwheat over a year ago and it’s now a basic food in my diet. I love it (as well as millet); here in Finland you can get buckwheat raw but also in this brown, “fried” version as well. After discovering that wheat-products (and even oat) are not good for my digestion – along with milk and other dairy products – I started using buckwheat and millet on a daily basis, usually cooking them into porridge. This summer I got myself some raw buckwheat, and I’ve been sprouting it and eating it for lunch. This dehydrating option sounds like an interesting thing to try out, especially now in the summer when warm porridge sometimes feels a bit too much in the mornings. I just found your blog today and it seems really inspiring! I went vegan over 10 years ago, but I’ve been going back and forth with it, sometimes eating eggs, cheese, butter and the occasional fish, though I’ve noticed that the fish isn’t really working for me anymore. It was also interesting to read about your (and of others’) eating disorders, I also have a history with them but it seems I’m getting better year by year. Although I still do have some moments of doubt; I seem to observe my body sometimes a bit too much and consider myself still “too big” (too big compared to… what?). But still, I have learned to value my body as it is, and I have finally started to exercise in order to make myself stronger, not in order to lose weight or burn calories. I want to take a good care of my body in order to enjoy life and do things I enjoy and want to do. Anyway, thanks for your blog – I still have to read it a bit further and hopefully find some nice recipes to try. I love your buckwheat cold cereal idea. I am just now adventuring out to make my own buckwheat creations! This morning, I am so happy to report that I came up with a Naturally-Sweetened Vegan Creamy Buckwheat Porridge with Baked Cinnamon Apples. It was divinely delicious! I’ll be posting a recipe on my blog real soon! For how long can you store buckwheat prepared that way? In fridge or room temperature? Thank you! Hi. How long do dehydrated groats keep in fridge? I found toasted buckwheat in the bulk section at my local co-op. I had a little bit last night for dessert with some plain yogurt and maple syrup. I see what you mean about it being an acquired taste, but mixed with something a little sweet, I think it’s nutty and delicious. Your site is making me try so many new things!